As I have been reminded ever since I was little boy when taken there on family outings (my parents loved it) – Southend hosts the longest passenger pier in the world. I have walked it many times since that time and every time all sorts of past memories flash in my mind. 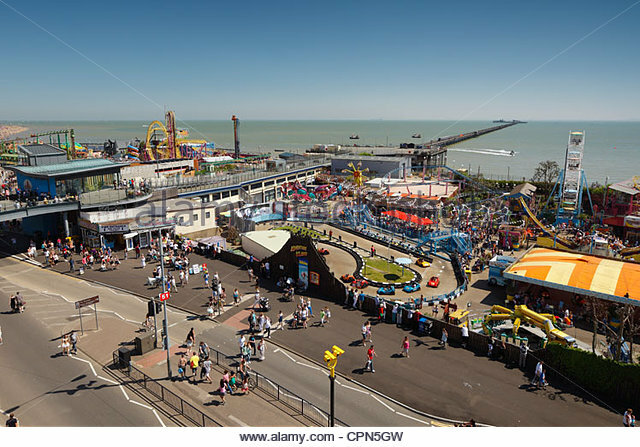 When we discussed the other day where we as a family might go for an afternoon outing, the majority vote was Southend seafront, to take in the Pier. I have to confess I was reticent: I don’t like crowds, I have been there – got the tee shirt etc., I find these days that while there are freebies like being able to walk along the sea front, that is about it and it is astounding how costly it can be: parking, eating and drinking, walking on the pier even and to my surprise since it wasn’t stated a visit to the Pier museum. But we went – and I rather liked it, partly because the venue was less important than the company. We parked in the Sea Life car park and ambled gently along a short stretch of promenade, taking in various sites, and got to the Pier via Adventure Island (which was free) which we decided to explore. It happens our son works there during his college vacation and it was his day off. It was nice just watching goings on including groups of school children – like people’s expressions as they negotiate “the Rage”. And it was onto the Pier, looking out to mud and bait diggers and an incoming tide. It was a warm day made cool by a stiff breeze. As I bemoaned before, as I recall long ago visits, getting to the end was anti-climatical because of a lack of attractions (unlike in my youth), although looking out to sea has its own therapeutic value and drinking beverages at the café at the end, while like most things when paying out was needed was a bit dearer than I would like, was still pleasant. And so we returned, and to cap a pleasant outing we decided to eat fish and chips at “Ye Old Chippy” opposite the Sea Life car park. It was a nice surprise, for the food was good because the fish was fresh and it was nice service. All in all this was nice ending to the day. In short, it was four hours well spent, and it merited an outing. While the Southend sea front trade is still seasonal, and where one can imagine all sorts of improvements (I miss the illuminations) it is an important part of the local economy. While there was a good many people out enjoying Southend sea front, I suspect on a fine high season day there will be many more, and it begs the question if parking is adequate. I think the seafront is a great asset to the town and the Pier is its greatest, and I would like to see it milked.